RESEARCH INTO THE METHODOLOGY OF CLAUDIUS PTOLEMY: Has computerisation led to a systemic failure in the simple comprehension of the very basic nature of the data in the “Geographia” of Claudius Ptolemy? Many papers, subject matter cartography, and more particularly those concerning the methodology of Claudius Ptolemy1 now include the “de rigueur” utilisation of computer programmes, computer generated visualisations and the Star Burst Plots which endeavour to illustrate data comparisons. That this usage of the computer does not of itself appear to offer any additional information to the subject matter and is merely presentational, should perhaps give cause for reconsideration by those authors of its usage. This paper is not a polemic against the use of computer generated data, which certainly has its place when appropriately used. It is in fact questioning the over complication caused by such usage when simple maps or diagram maps used as the prime research tool would actually explain more. This paper illustrates by example that the use of simple maps, for that is in fact all that Claudius Ptolemy has bequeathed to us, a fuller understanding of “Geographia” can be simply gained. There are many extant copies of the text “Geographia” which have been translated from the Greek to both Latin and English. Which text is the Alpha copy or which texts are the Alpha copies from which all others are translated is still debated. It is possible that the Vatopedian Codex from Mount Athos is one such document. We know that the monk Planudes translated a copy from Greek to Latin in the 13th century and Jacopo Angelo da Scarparia completed a Latin translation in 1406, now Codex Lat V F 32 of the Naples Library. Indeed the whole re-igniting of the use of Ptolemy’s Geographia is succinctly put by Lelio Pagani2 in Pages vi and vii of the introduction to a volume of maps taken from the Codex Lat V F 32. It is self evident that copy errors abound in these many codices and most can be simply rectified by textual comparisons. Many however require that maps be drawn using one codex list to compare to another. The simplest of methodology that of direct map overlay actually produces the best visual comparison and thus provides the tool to unravel century’s old errors. It is also very apparent from the extant codices that the mapmaker Nicolas Germanus, the German cosmographer and illuminator is responsible for many of the actual maps. There are thought to be some 19 codices attributable to him. However there are variations in his maps and it is possible the differences stem from the usage of various codices during his lifetime. Are computer aided design and visualisation tools the correct methodology for examining and determining answers to the questions raised when the text of Claudius Ptolemy is studied and used to draw maps? One of the tools used today is the programme to “Best Fit” a Ptolemaic map to a geographical profile of the same land area. Others are, vector analysis, Star Burst Plots and of course GIS cartography. But do any of these programmes, when used, increase our knowledge of Claudius Ptolemy, how he constructed his maps/tables and why the world circle and oikoumene length become so distorted? Are they just convenient tools in an age that has embraced the computer to such an extent that we are in danger of over complicating the research and losing sight of the simplicity of the data bequeathed to us. The maps drawn from the details given within “Geographia” can be visually stunning as Nicolas Germanus has shown. But, strip away that visualisation and look at the data actually available and it will be found to be so very little. The coastlines are defined by a few simple terms: Sinus/Bay, Promontory, Estuary, River Mouth, and occasionally Magnus Littus, Chersonesus and Mountain. We do not know, nor are we told just how indented the coastline is for the Sinus/Bay and similarly just how much the land retreats either side of a Promontory. Are the Estuaries the equivalent of the Thames or Severn, or are they no more than large river mouths? Thus if we plot a map from the data provided by Claudius Ptolemy the final plot will be subjective, particularly if we are aware of the geographical coastline in its fine detail. If we draw the maps of Ptolemy, as perhaps we should using the accepted methodology for a Graph, we will use smooth curves to link the points and thus restrict prior knowledge. But, we will not have produced a map plot that can be said to represent the coastline in geographical terms. Therefore why would we consider it proper and acceptable to then stretch that map plot around the corresponding geographical map and for what purpose is it carried out? Claudius Ptolemy has not bequeathed to us sufficient data to represent the littoral of a country other than in the broadest of terms which produce a visual similarity. It is so very evident that distortion, falsification and dogmatic adherence to a length of oikoumene has produced in the final evaluation visually stunning maps by the hand of medieval cartographers, but they are maps which for the most part are impractical to use. The central alignment measure methodology described in “Geographia” Book 1, chapter XII, based upon 36N latitude, if analysed commencing at The Pillars Of Hercules produces a Mediterranean Sea length which is vastly inflated: a Middle East length which is comparable to reality; an Indian plot which is a travesty of shape and distance and a curtailment of the Far East because it had to fit within an oikoumene of 180 degrees longitudinal spread. Therefore to choose individual countries from this overall Ptolemaic concept and analyse the profile “Best Fit” to a geographical map diminishes the whole and does not deal with the overall concept. That is how it must be analysed, as it is an overall design, each part relying on the next for logic. For the work of Claudius Ptolemy to be a coherent whole (even flawed as we perceive it) individual countries are a sub-set and removing one and analysing it without reference to the whole is perhaps akin to the proverbial circular argument. If we study two countries, Italy and Greece, and measure the coastlines of each we arrive at a disturbing mismatch in comparison to the Ptolemy plots which perhaps indicates a “Best Fit” examination is not the most appropriate. Geographically the measurement is c17000 stadia, and sufficient discrepancy to negate the examination. GREECE; from Apollonia(Albania) to the Nessus Fluvium is c18200 stadia. Geographically it is c25500 stadia, and is thus a 33 percent error of length. It is therefore necessary to evaluate the whole world according to Claudius Ptolemy, thus gaining an insight into the concept and how the several parts fit prior to looking at individual countries. 1. Southern boundary of inhabited earth: parallel south of Equator, 16° 25’ of which the great circle has 360° and the parallel through Meroe is precisely the same number of degrees north of the Equator. 3. Wherefore the breadth (N/S) of the entire earth 79° 25’, approx 80° 00’ or 40000 stadia in as much as one degree measures 500 stadia and the circuit of whole earth is 180000 stadia. 10. Along Parallel of Syene (ie 23 50’ N) is approx 82336 stadia. These calculations are made according to the proportions of the aforesaid parallels to the Equator. Perhaps the most outlandish statement made by Claudius Ptolemy is as follows: “in as much as one degree measures 500 stadia, as has been found by careful measurement and the circuit of the whole earth is 180000 stadia”. That careful measurement produced a latitudinal degree of 500 stadia each being c184 metres in length or 92 Km, when in reality it is some 111.13Km per degree and the Stadion would therefore have measured some 222.26 metres. The distortion of the latitudinal measurements of the world thus led to the distortion of the world map and particularly the map of Britannia. Need this have happened? The Romans had already determined the degree length as 75 Roman Miles, 600 Stadia equalling 68.934 statute miles or 110.933 Km; this is a near perfect measure. The ancient Egyptians had determined the length of the great circle as 3814 ITERU or 39665600 metres, which is 110.182Km per degree; another near perfect measure. Eratosthenes, a fore-runner of Ptolemy in the Library at Alexandria had determined the world as 252000 stadia of 157.5 metres or 39690 Km and thus each degree was 110.25Km. Evidently it need not have happened. In his co-ordinate lists Ptolemy uses the minor division of 5 minutes for each place name. He has thus chosen a maximum movement for each point of 2.5 minutes or 1/24th degree, the equivalent of 3.75Km. This may be considered inconsequential given the methodology and accuracy he could achieve. It is therefore possible to opine that direct comparisons by “Best Fit” techniques are not the most reliable method of examining these maps and the data. As already shown Claudius Ptolemy has distorted the world in both latitudinal and longitudinal measure with the use of a stadion of 184m. The length, longitude, of the oikoumene has been restricted to 180 degrees (Marinus of Tyre=225 degrees) and this caused large distortions to Africa and the Far East, by the overlong measure for the Mediterranean Sea and India. But the comparison of like for like projections can be made by establishing the prime locators for each map. Certain points are easily noted as prime locators, such as Alexandria, and the first measurement node used by Ptolemy, the Sacred Promontory of Iberia. How can that statement be justified? Simply put, Ptolemy has used the correct figure for Alexandria’s latitude, 31N ( although it is obviously only 31 x 500 stadia and not 31 x 604 stadia from the Equatorial line), and then he has given a latitude to the Sacred Promontory of 380 15’ and not the correct 37N. Why is this important? The calculation of distance measure indicates that: 60 geog = 6 x 604 stadia or 3624 stadia and 380 15’- 310 = 70 15’ x 500 = 3625 stadia. The Sacred Promontory of Iberia has been so positioned as to be geographically correct by latitude and is thus a prime locator of the whole map that has been constructed by Ptolemy. This also indicates that Alexandria is actually the prime original or singular point for the whole construction to be manipulated such that correct distance measures and latitudes of primary Poleis are maintained. Thus we can establish that Ptolemy started to construct a set of place positions on which he could draw his world map. Table 1(which is page 9 of this text) indicates the definition of the Mediterranean Sea by Poleis, but only very specific Poleis have the correct latitudinal figure used. Thus we can indicate the third and probably final locator for the Mediterranean Sea and its environs. The poleis, Byzantium, 41N geog and 43° 05’ CP, both of which give a 6040 stadia measurement north of Alexandria. With Byzantium correctly positioned to the geographical world latitude, we then see the whole of the north coast of Turkey to Trabzon/Trapezus quite accurately positioned from the base line of 31N and Alexandria. 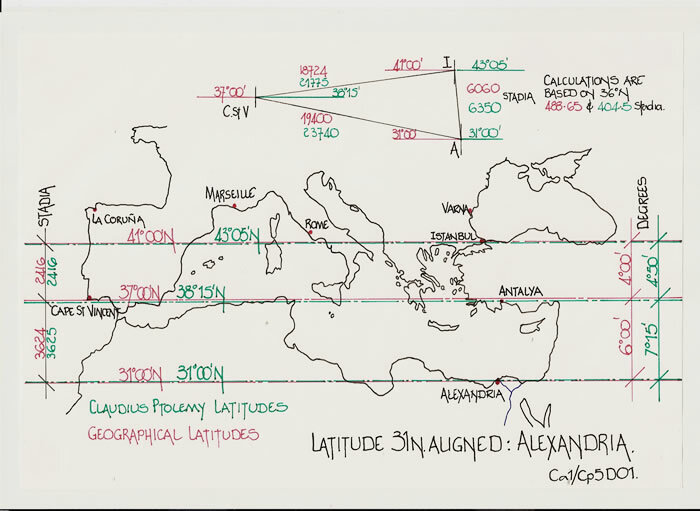 Ca1D01 illustrates the latitudinal calculations and Ca1D02 has the Ptolemy map overlaid onto the geographical map with one coincident point, Alexandria to illustrate the data discussed. But if we examine the foregoing in detail, the position of the Sacred Promontory or Cape St Vincent is 60 north of Alexandria and Byzantium is 100 to the north. These are quite remarkably 6 and 4 degree divisions and may imply that there is a 2 degree or 2 x 604 = 1208 stadia subdivision within the map of Ptolemy. The next line north would therefore be 43N geog or 45° 30’N CP, and perhaps in the south, 29N or 29° 35’N CP. There is a coincidence on the north coast of Iberia, which is 43° 30’N geog and 45° 30’N CP. This very close comparison is discussed at length in the paper reference Cp2. Further north if we investigate 12 degrees geographical from Alexandria, that is 14° 30’N CP, or 43/45° 30’, the city of Varna/Odessus is situate at 43° 12’G/45 CP and at the western extremity there is Bordeaux/Burdigala 44° 50’N geog and 45° 30’N CP. Thus the eastern points have a close correspondence to geographical positioning but the western area Aquitania Gallia has a discrepancy of 2 degrees CP. It is not until Britannia that a close position is reached between the two latitudinal measures with Rutupiae 54N CP and 51° 18’N geog, or 11500 and 12080 stadia north of Alexandria. Ca1D01 – The Latitude 31N aligned: Alexandria. This diagram is the geographical Mediterranean Sea with the latitudinal lines appended such that the coincident lines can be shown and the distance measures indicated. Thus with 31N aligned, the 37N geog line is the 38 15N CP line and the 41N geog line is the 43 05N CP line. Claudius Ptolemy has positioned Alexandria at 60° 30’East. The Sacred Promontory is the first node point for the maps construction and is set at 2° 30’East. The poleis of Byzantium is positioned at 56° 00’ East. They are thus 58° and 53° 30’ respectively from the Sacred Prom. In paper Cp2 it has been shown that the Mediterranean Sea was expanded in length by precisely the inverse ratio of the cosine for 36 degrees. That is cosine 36 = 93/115 and the expansion is 115/93. Diagram Ca1/CP5D01 has appended a simple diagram containing the three node points, Sacred Prom 20 30’E/38 15’N, Alexandria 60° 30’E/31N and Byzantium 56E/430 05’N. The diagram has distances calculated at 36N for comparative research, but it is the calculation at 380 15’N that is crucial. Thus along the 38° 15’N latitude the distance from Sacred Prom to Alexandria = 58 x 392.66 stadia = 22774.28 stadia. This is the equivalent of 48 degrees geographical, i.e. 22774.28/474.33 = 48.0136 degrees. But, geographically the calculation is 9W + 30E or 39 degrees. Thus there is an expansion of 39 geog to 48 CP or 16:13, which will calculate to the inverse ratio of cosine 35.66 degrees, so very close to the 36 degrees ratio of 93/115. 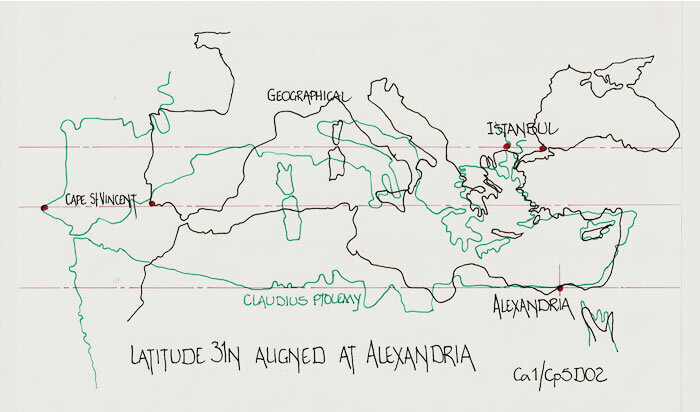 Claudius Ptolemy must therefore have known the precise distance from the Sacred Prom to Alexandria by coastal measure and been able to distort the northern littoral to accommodate the coastlines of Spain, France, Italy, Greece and Turkey whilst mathematically controlling the longitudinal measure. Therefore we can surmise that these definitive locators are the base points from which comparative maps geographical to CP can be aligned and the information within the Geographia of Claudius Ptolemy analysed. Claudius Ptolemy has signalled quite clearly that the basic construction of his map is based upon geographical or true positioning of at least three points as has been indicated. The Southern littoral of the Mediterranean Sea has been stretched to accommodate a nearly correct length of the northern or European coastline. The latitudinal spread of the Mediterranean Sea has been fixed by the correct latitudinal figures for Alexandria and Marseille but on a world which is 500/604 ratio too small. The length of the Mediterranean Sea has therefore expanded to accommodate the northern littoral length by a fixed ratio of the inverse proportion of the cosine of 36 degrees. That is from 93/115 to 115/93. We therefore have a complete fabrication of the map plot and so little actual map detail that, although we can draw maps based upon the data provided by Claudius Ptolemy and consider them “to be so nearly accurate in their representation” much of this is from a ready knowledge in this day and age of the geographical shape of the worlds country’s. Claudius Ptolemy has not bequeathed to us sufficient data to draw a detailed and therefore comparable map to a geographical plot. However we can compare those two maps by using the prime locators and specific latitudinal lines that they are upon. Claudius Ptolemy used coastal lengths, but we do not know if that is the sailing measure transferred to an actual coastline measure and could therefore be several stadia from the shore line, or it is a mixture of both land and sea measures to aggregate a land measure. Thus to wrap a Ptolemaic map around a geographical map to ascertain coincident points or establish poleis, is using the data to an extent that is far in excess of its basic accuracy. We should consider carefully what we are trying to achieve and not allow the computer to lead the research just because the programme has been written. The easiest option is not always the most appropriate. Cp1 – CLAUDIUS PTOLEMY; FALSIFICATION; REGIMENTATION OR SYMMETRY. AN INVESTIGATION INTO THE FORM OF BRITANNIA AND THE TURNING OF SCOTLAND WHILST MAINTAINING THE CO-ORDINATES. Cp2 – THE MEDITERRANEAN SEA OF MARINUS OF TYRE AND CLAUDIUS PTOLEMY. CONTROLLING THE LATITUDES BUT EXPANDING THE LONGITUDES TO ACCOMMODATE THE ACTUAL LITTORALS. Cp3 – INDIA INTRA ET EXTRA GANGEM + SINAE. THE MAPS OF CLAUDIUS PTOLEMY EXPLAINED WITH THE RESOLUTION OF PLACE-NAMES INCLUDING TAPROBANE AND CATTIGARA SINA. Cp4 – THE TEXT OF MARINUS THE TYRIAN AND CLAUDIUS PTOLEMY GEOGRAPHIA, BOOK4 CHAPTERS 1, 6, 7 & 8. THE WEST COAST OF LIBYA EXPLORED, THE ZERO LONGITUDE DETERMINED, AND, THE EAST COAST CAPES LOCATED. These texts are all available on this site. There are also texts concerning Eratosthenes and Strabo, The Roman World Survey and Roman surveying in Britannia, as well as a French Cadastral mystery, and texts concerning the Gough Map and Saxton Map in the UK. 1. Stevenson, E.L. (1932), “Claudius Ptolemy: The Geography”. New York. introduction by Lelio pagani, (1990). Magna Books Leicester England. 3. Codex Lat VF 32 is available on CD Rom from the Naples Library.